(1829-1908) Born in Birmingham, England in 1829, Thomas Hill immigrating to the U.S. in 1844. He settled with his family in Taunton, MA and worked in Boston as a carriage painter. He painted in Massachusetts throughout the 1850’s and often in the White Mountains of New Hampshire with a group of artists which included, Inness, Bierstadt, Virgil Williams, and his brother Edward Hill. For health reasons, he was forced to seek a milder climate and, with wife and children, made the overland trek to California in 1861. After settling in San Francisco, he advertised as a portrait painter and in 1862 made his first trip to Yosemite accompanied by William Keith and Virgil Williams. 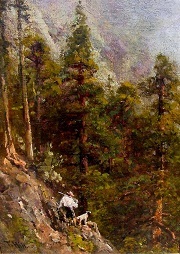 In 1866 he exhibited Yosemite scenes at the National Academy. In 1871 Hill returned to San Francisco to help organize the San Francisco Art Association. While his wife maintained the family home in Oakland, Hill built a studio in Yosemite in 1883. The park remained Hill’s home except during the winter months when he lived in nearby Madera County or in his San Francisco studio in the Flood Building. 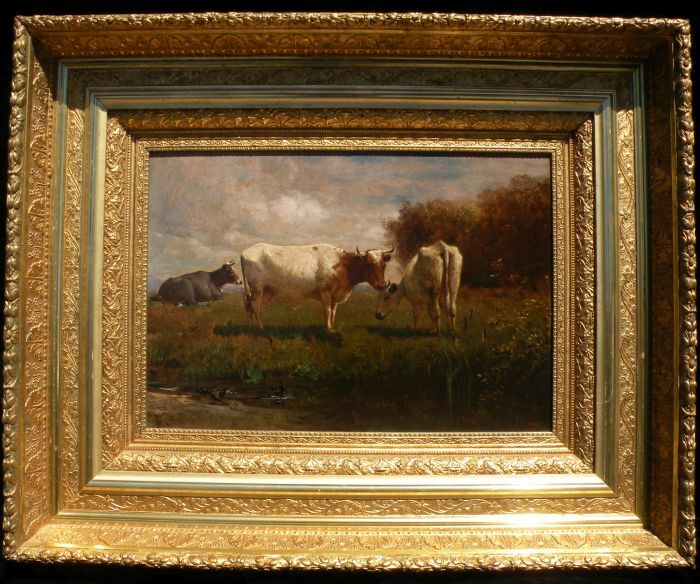 During the 1870’s and 1880’s, his work was in demand and brought very high prices. Today his work has regained its proper stature and he is considered a giant in American art. Hill painted over 5000 paintings of Yosemite. Hill died in 1908 and is buried in Oakland’s Mountain View Cemetery. Member: San Francisco Art Association; Bohemian Club. Works held: Oakland Museum; Crocker Museum; Sacramento Society of California Pioneers; Stanford Museum.